General Giap orders the Viet Minh army to attack the French garrison on May 1st 1954, within a few days the French base is captured. General Navarre the commander of the French Army in Indochina is replaced by General Ely, a biography of the new General. 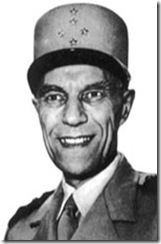 The French Government of Laniel falls and he is replaced by Pierre Mendes France who promises to end the war in Indochina.